Preheat oven to 350°F. Grease a 9-inch round cake pan with cooking spray; set aside. Put 2 tablespoons of the whole wheat pastry flour, sugar, butter, cinnamon and cardamom in a medium bowl and mix together with a fork or your fingers until well combined and mixture is in large clumps; set streusel aside. 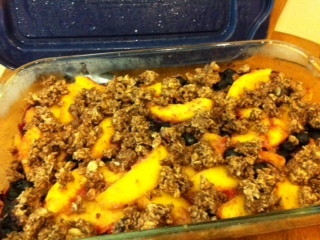 Spoon batter into prepared pan and sprinkle reserved streusel over the top. 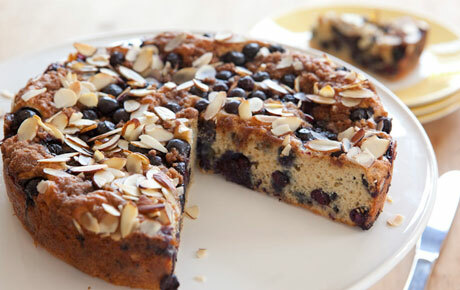 Scatter remaining 1 cup blueberries over the streusel then top with almonds and bake until a toothpick inserted in the center cake comes out clean, 30 to 40 minutes. Once cooled, loosen edges of cake and transfer to a plate. Cut into slices and serve. Well, those are the “rules” but let me tell you MY way! Drop the calories to less that 200 per 1/4 of the recipe, add some healthy fiber and drop quite a bit of fat! I replaced the whole wheat pastry flour with instant oatmeal (in both places where it is used). 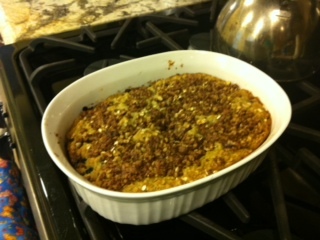 I used Splenda in place of the white sugar, but for the streusel, I did use real brown sugar. I used egg whites instead of whole eggs and “light” blueberry yogurt. Also, I used Brummel and Brown yogurt-butter instead of traditional butter. Finally, the nuts are an excellent source of healthy fats, so feel free to use them. I didn’t use them in my first try with this recipe, but I’m sure they’re awesome! Oh I am so excited to share my first recipe with you this month! It isn’t a true “blueberry” recipe, but I find that pairing it with blueberries is exceptionally indulgent! I am a certified yogurt fanatic. Being a vegetarian, Greek yogurt is my go-to source of protein. Until now, Trader Joe’s could barely keep their shelves stocked in the city where I live. I have learned to make do with Oikos, Dannon and some generic varieties. However, I have seen the light! 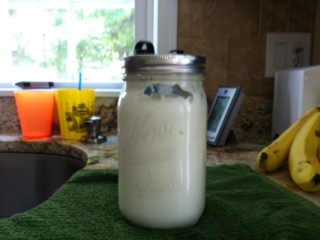 Following a tip from my Aunt Doris, I decided to attempt making my own yogurt. I will share my new found recipe with you giving credit where credit is due: first to my Aunt for planting the idea and second to One Good Thing by Jillee. Oh, and by the way, last week was One Good Thing’s birthday! Happy Birthday, Jillee! Pour about half a gallon of milk into the crockpot. Turn it on low and allow the milk to warm for about 2.5 hours, or until it reaches 180 degrees. Unplug the crockpot, remove the cover and allow it to sit on the counter for about 3 hours, or until it cools to about 105 degrees. Remove about 2 cups of the warm milk and whisk into it the 1/2 cup of yogurt, then recombine it with the warm milk. Next, re-cover and wrap the whole crockpot liner in a heavy bath towel to insulate and place it in your oven with THE LIGHT ON! That’s about all the warmth you need. Leave the yogurt in the oven for about 8 hours or overnight. In the morning, check the mixture to see if it has thickened to a runny yogurt consistency. Unwrap it and place it in the refrigerator for about 3 hours to continue cooling and solidifying. Now, here’s the Greek part: Find a colander that will fit inside a large bowl but allow the yogurt to drain into the bowl. Line the colander with 9 square feet of cheesecloth and pour your yogurt into it. Place the colander and bowl into the refrigerator again and leave it for about 3 more hours. There will be a milky liquid in the bowl when you return, that is the whey that has been strained from the yogurt, leaving a thick, creamy, tangy Greek yogurt that FAR surpasses any you’ve ever paid for! 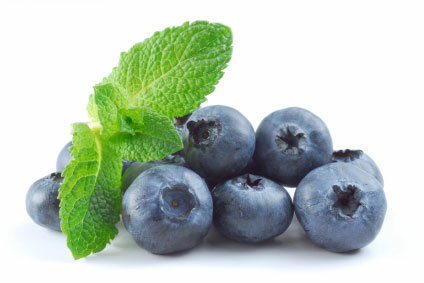 Enjoy – with blueberries! 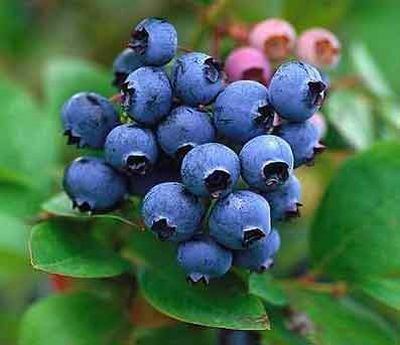 Happy National Blueberry Month! 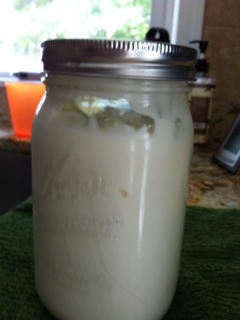 Jillee gave credit to Shannon’s Kitchen Creations for the crockpot yogurt recipe. Thank you to you too, Shannon! 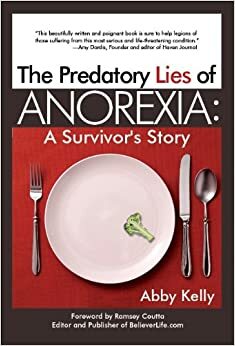 Now, if anyone asked me that, my answer would probably be, “Because most of what I eat is green.” But back then I said, “I workout so that I can eat whatever I want.” It’s true, for a few dreamy years you can eat nearly anything you want. Your waist may not show it, but your heart will. 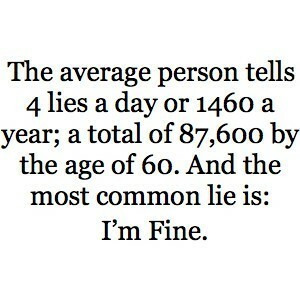 In fact, this weekend, my husband and I came across an article that proves my point. An average size girl who ate nothing but chicken nuggets for 15 years, collapsed due to malnutrition. She wasn’t fat, she didn’t really over eat, I don’t know how much exercise she did. However, your body craves the nutrients that your Creator prescribed in the first place. I love to experiment in the kitchen. A few of my favorite resources are Eating Well and Clean Eating. Usually, I start with something they suggest and modify it until I have something only remotely similar. Try this one, courtesy of the 21-Day Kickstart Vegan, a fantastic App available for the IPhone. Combine beans and broth and garlic in a large saucepan. Place chopped kale on top of beans and bring to a boil. Cover, reduce heat to low and simmer until kale is tender, about 15 or 20 minutes. Remove from heat and stir in olive oil, salt and pepper and Tabasco to taste. I topped my serving with feta cheese. I think I served this to Patrick once and then decided to eat all the leftovers myself. It is delicious!